Topics covered will be Methods and Materials used in landscape oil painting; How to isolate and symplify the landscape; buildings in the landscape, value relationships, design and colour harmonies and mixing will be touched on as well. A discussion of oil painting materials as well as learning to see shapes and simplifying as it applies to landscape painting. This will be illustrated by way of a demonstration dealing with a building in the landscape. Students will then work on their own paintings with a lunch break near noon. Painting will continue through the afternoon followed by a group critique. Throughout the day individual attention will be given by Mr. Gorey. Students are asked to bring photos or other reference materials to paint from. ABSOLUTELY NO SOLVENTS IN THE CLASSROOM. NO ODOURLESS THINNERS, TURPS OR ANYTHING THAT SMELLS!!! HB pencil and small tube of cobalt blue acrylic and cheap 1/4” brush. Water container. Linseed oil, baby oil and a bar of soap; ABSOLUTELY NO SOLVENTS OF ANY KIND!!!! Christopher Gorey was born and educated in the US and graduated from the Massachusetts College of Art. 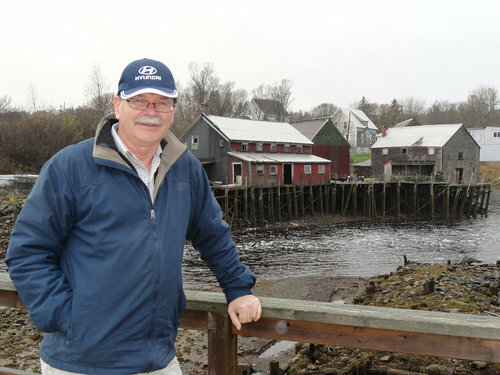 After numerous painting excursions to Atlantic Canada he moved to the small coastal village of Ingonish to take up painting full time. His career flourished quickly with solo and group exhibitions across North America. In 1981 and again in 1987, Mr. Gorey’s One Dollar Commemorative coin designs were chosen by the Mint to be produced in silver. His paintings have won awards at La Societe Canadienne de L’aquarelle, QC, The Watercolour Art Society of Houston, TX, The Adirondacks National Exhibition of American Watercolour, NY, among others. Mr. Gorey works in oil and watercolour and his paintings, which reflect a feeling of light and texture, not only depict the people and landscape of his adopted CB but other areas of Eastern Canada as well. His work can be seen in various galleries throughout NS and in St. John’s Newfoundland.